This is an article from The Courier Mail about anxiety in youngsters explained by Dr Paula Barrett. “A NEW study has found almost 50 per cent of kids don’t play every day, prompting an expert to warn of a generation of depressed and anxious youngsters. The study, hailed as the first of its kind in Australia, carried out a total of 1397 interviews, including 344 with children aged 8-12. 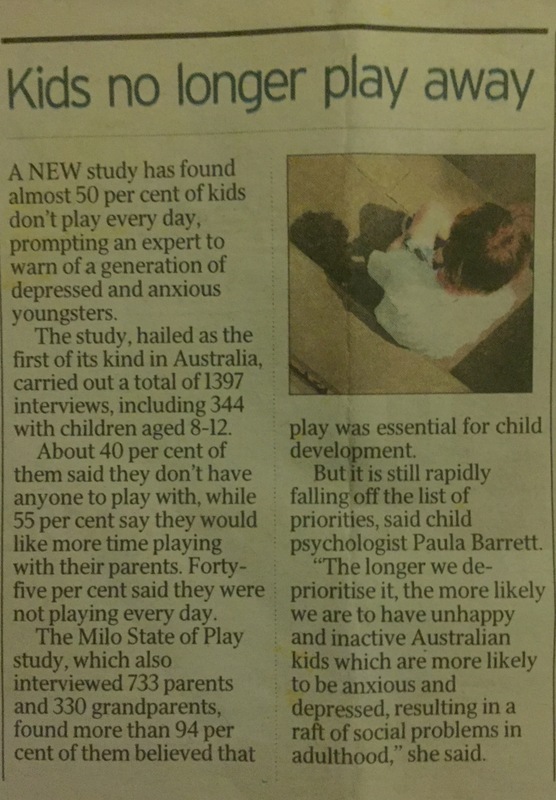 About 40 per cent of them said they don’t have anyone to play with, while 55 per cent say they would like more time playing with their parents. Forty-five per cent said they were not playing every day. 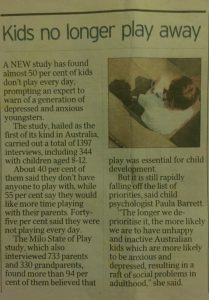 The Milo State of Play study, which also interviewed 733 parents and 330 grandparents, found more than 94 per cent of them believed that play was essential for child development. But it is still rapidly falling off the list of priorities, said child psychologist Paula Barrett.